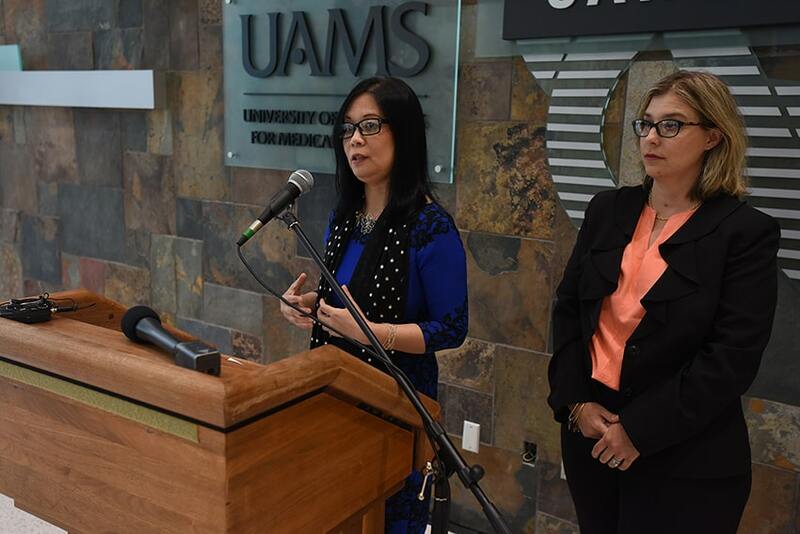 Ling Gao, M.D., Ph.D., (left) and Aime Franco, Ph.D., address questions from the media about their American Cancer Society Research Scholars grants. May. 9, 2017 | May 9, 2017 | Two cancer researchers at the University of Arkansas for Medical Sciences (UAMS) have been awarded Research Scholar Grants from the American Cancer Society. Aime Franco, Ph.D., and Ling Gao, M.D., Ph.D., each received a four-year grant of $791,000 to support their ongoing cancer research. 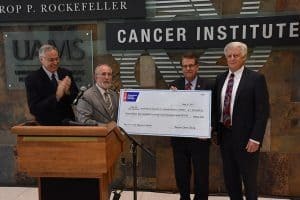 Charles Saxe, Ph.D., (second from left) of the American Cancer Society, presents a check representing $1.58 million in grant funds to UAMS representatives (from left) Chancellor Dan Rahn, M.D. ; Cancer Institute Director Peter Emanuel, M.D. ; and Vice Chancellor for Research Larry Cornett, Ph.D. 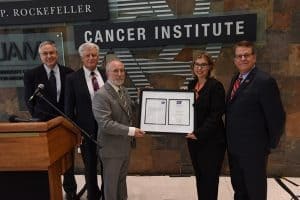 The grants are among 109 national research and training grants totaling more than $45 million that will fund investigators at 75 institutions across the United States; 102 are new grants while seven are renewals of previous grants. The grants go into effect July 1. “We at the American Cancer Society are proud to partner with the University of Arkansas for Medical Sciences to award over $1.5 million to Drs. Aime Franco and Ling Gao. Based on our extremely rigorous peer review system, we think these two young scientists represent some of the finest cancer researchers in the country,” said Charles Saxe, Ph.D., scientific director American Cancer Society’s Program in Cancer Cell Biology and Metastasis, Extramural Research Department. Franco’s project titled “Tumor-Stromal Crosstalk in Papillary Thyroid Cancer” seeks to determine how non-thyroid cells found in and around thyroid tumors promote cancer progression and metastasis, which is the spread of cancer to other parts of the body. 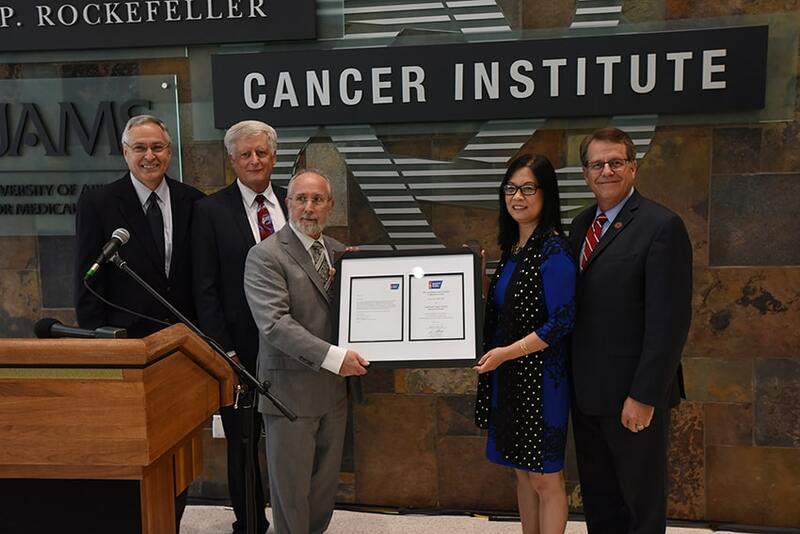 Ling Gao, M.D., Ph.D., (second from right) receives a framed plaque commemorating her American Cancer Society Research Scholars Grant from Charles Saxe, Ph.D. Also pictured are UAMS representatives (from left) Chancellor Dan Rahn, M.D. ; Vice Chancellor for Research Larry Cornett, Ph.D.; and Cancer Institute Director Peter Emanuel, M.D. “Our research has found that while thyroid tumors start out as primarily thyroid cells, they transition to tumors composed primarily of non-thyroid cells. It is critical to understand what these cells are doing, how they are driving progression of the tumor, and how we can target these cell types more effectively with our therapies,” said Franco, assistant professor in the UAMS College of Medicine Department of Physiology and Biophysics. According to the National Cancer Institute, thyroid cancer rates have risen significantly during the past several years, due in part to improvements in early detection. While it is now the eighth most common cancer in the United States, thyroid cancer is predicted to rise to the fourth most common cancer by 2030, surpassing colon cancer. 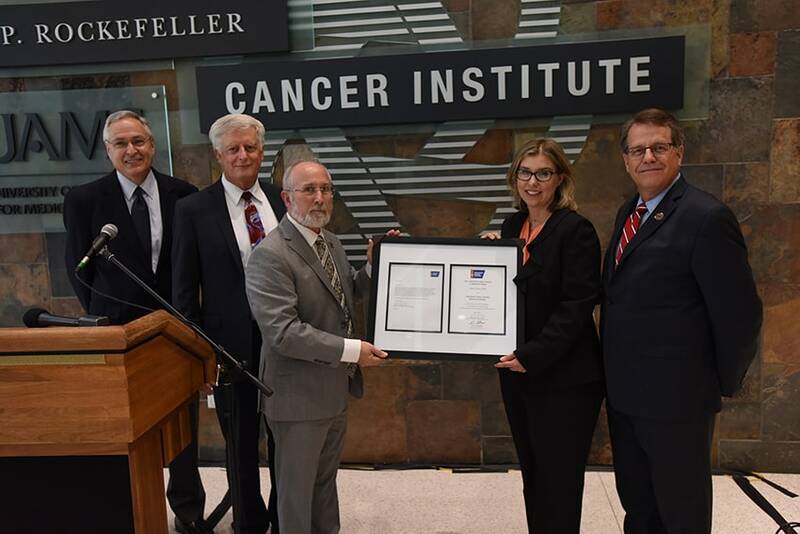 Aime Franco, Ph.D., (second from right) receives a framed plaque commemorating her American Cancer Society Research Scholars Grant from Charles Saxe, Ph.D. Also pictured are UAMS representatives (from left) Chancellor Dan Rahn, M.D. 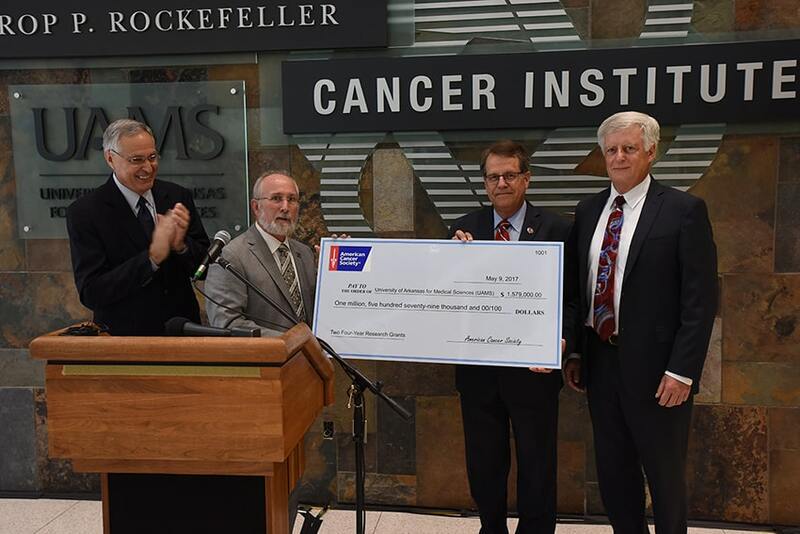 ; Vice Chancellor for Research Larry Cornett, Ph.D.; and Cancer Institute Director Peter Emanuel, M.D. Gao’s project will investigate the potential of using drugs such as idelalisib that inhibit an intercellular signaling pathway called P13K to suppress the abnormal activity of the pathway and kill the tumors. “There are no targeted therapies for metastatic Merkel cell carcinoma. Successful completion of this study will pave the way for potential clinical trials using P13K inhibitors to treat advanced Merkel cell carcinoma patients,” said Gao, associate professor in the UAMS College of Medicine Department of Dermatology. In addition to her research interests, Gao also established and leads the clinical program at the UAMS Winthrop P. Rockefeller Cancer Institute, providing personalized treatment plans for patients with Merkel cell carcinoma.